An exception class to notify of no connection. 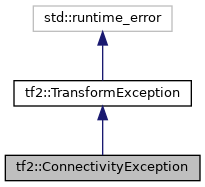 This is an exception class to be thrown in the case that the Reference Frame tree is not connected between the frames requested. Definition at line 55 of file exceptions.h. Definition at line 58 of file exceptions.h.